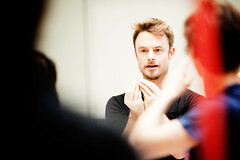 American lighting designer Natasha Katz has a strong creative relationship with Christopher Wheeldon, and for The Royal Ballet has collaborated with him on Tryst(2002), Alice’s Adventures in Wonderland (2011) and The Winter’s Tale (2014). She has also worked on Cyrano de Bergerac (2006), directed by Francesca Zambello, for The Royal Opera. Katz trained at Oberlin College and has gone on to work internationally creating lighting designs in theatre, opera and dance. Her other collaborations with Wheeldon include Continuum (San Francisco Ballet, 2002), Carnival of the Animals (New York City Ballet, 2003), An American in Paris (New York City Ballet, 2005; Théâtre du Châtelet, 2014; Broadway, 2015; London, 2017), Swan Lake (Pennsylvania Ballet, 2004), Cinderella (Dutch National Ballet, 2012), and The Nutcracker (Joffrey Ballet, 2016). Katz’s other dance work includes American Ballet Theatre’s production of Don Quixote and productions with companies including San Francisco Ballet and National Ballet of Canada. Katz has worked extensively on Broadway, credits including Long Day’s Journey into Night, An American in Paris, The Glass Menagerie (Olivier nomination 2017), Once, The Coast of Utopia: Salvage, and Aida (all Tony Award-winners) as well as Frozen, Springsteen on Broadway, Hello, Dolly! (starring Bette Midler), School of Rock, Aladdin, Skylight, Motown, Follies, Hedda Gabler, A Chorus Line (revival), Sweet Smell of Success, Twelfth Night, and Beauty and the Beast. Opera work includes two productions of Norma (both starring Joan Sutherland), Cyrano at the Metropolitan Opera, New York, and New York City Opera’s production of Die Soldaten. Katz’s permanent audio-visual shows include The Masquerade Village at the Rio Casino, Las Vegas, and Big Bang at the Hayden Planetarium in New York. Christopher Wheeldon’s ballet adaptation is a true collaborative effort, with spectacular designs from all the creative team coming together to tell the story. Artistic Associate of The Royal Ballet earns Best Choreography award for An American in Paris, with Bob Crowley, 59 Productions and Natasha Katz also honoured.